This is fast becoming a popular Aconcagua option, with the highest success rate. We spend the first week acclimatizing in the Silver Range, a part of the large frontal range, between main Andes and the Pre Andes. This pre-acclimatization approach is increasing summit success ten fold and also offers participants a little more of Argentina instead just going straight to the mountain and home again. We climb a pyramid shaped peak called Vallecitos (5400m/17,440 ft), in order to acclimatize more effectively and explore a beautiful mountain area instead of going up and down multiple times on the same route on Aconcagua carrying loads to acclimatize. This acclimatization side trip is followed by a rest day in Penitentes. This allows us to tackle Aconcagua with renewed energy and motivation and in great physical condition, allowing us to do the climb in only one day. Our climbing route on Aconcagua is the Standard Route. Jan 30 Hotel Arrive Mendoza- transfer to our hotel. This is a lovely little city and wine capital of Argentina. Jan 31 Lodge Final day for permit issuance, last minute supplies shop and board mini van for Vallectios Ski Resort at (3000m-9900 ft.) located in the Silver Range, part of the large frontal range. We will stay in a lodge. Dinner and breakfast included. Feb 03 Camp Rest day , to help with acclimatization. 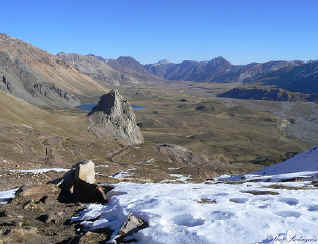 Feb 05 Camping 8- hours to the SUMMIT of Vallecitos Peak- (5400m-17,800 ft). With an early start we climb up the slopes to gain an obvious saddle. From here, we follow an easy yet majestic ridge to the summit. Full day climb with great vistas of the nearby peaks including Aconcagua. Return to La Hollada camp. Feb 07 Hotel After a late morning start and breaking down camp, we return to Vallecitos Ski Resort where our mini van will be waiting to take us to Penitentes. spend the night, dinner and breakfast. Feb 08 Camp Transfer by van to park gate. Hike to Confluencia (3300m) camp, mules carry equipment, bags and food. Feb 09 Camp Hike to Plaza De Mulas 4370m – 8-hours- supported by mules. Feb 10 Camp Plaza De Mulas- 4370m- acclimatization layover. Feb 12 Camp Chorela- 6000m- 3 to 4 hours. 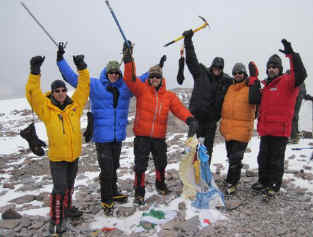 Feb 13 Camp SUMMIT DAY – 6962m- 15- hours round trip, camp at Chorela. Feb 15 Hotel Pente del Inca (trail head) 8- hours plus 3 hour drive to Mendoza. Feb 18 transfer to the airport or take in other parts of Argentina: Buenos Aires, Patagonia etc. all within reach. Our expedition begins in Mendoza, Argentina. Upon your arrival to the international airport or bus station in the City of Mendoza transfer to the hotel to hitch up with Tim or Angel to go over your gear items. This is a very important step. Mendoza is the last place available, where you can buy or rent equipment, it is not always easy to find the things you need at the last minute in this city so please do your best to get properly geared up before arriving here. After this, there is a group meeting and later we will go out to one of the many fine restaurants for dinner. You get the chance to taste the delicious argentine "asado" (barbecued meat) and wonderful wines from Mendoza. There are numerous alternatives for those who do not drink wine or eat red meats. Dinner in Argentina is usually around 9:00 P.M.
Transport by taxi (cost $6US to $9US) to th Hotel Aconcagua. After clearing customs proceed out the door and taxi's will be waiting to whisk you away. Transport to and from Mendoza-Penitentes in a private vehicle. From the hotel we take you to Penitentes, 180km, over a mountainous road where you can enjoy the most spectacular view of the Central Andes. Overnight at the Aylen Hotel. 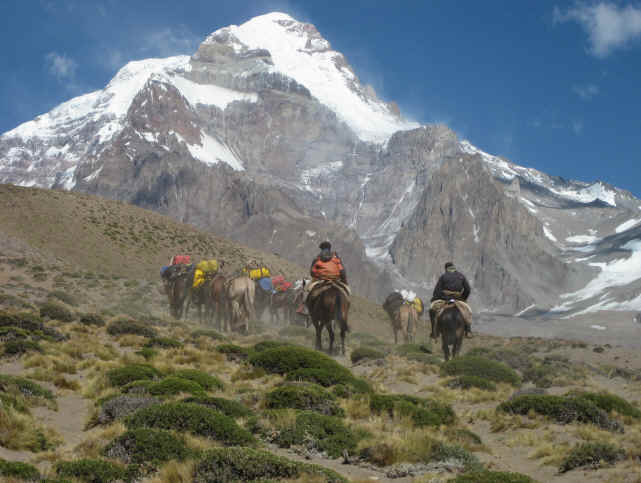 Transport to and from Penitentes to the entrance of Aconcagua Park to start the trekking. We no longer include this amount in the above program costs. We are advised since the amount changes frequently so it is better that each participant pay upon arrival the rate at that time. You can estimate to bring with you between $300 to $400US for this. 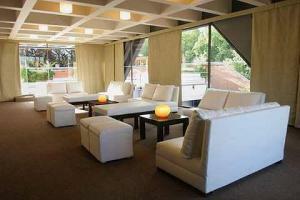 Hotel Aconcagua in Mendoza is at your expense. 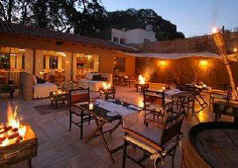 We have secured rates between $75 and $85US per night. You should budget for 2-nights here. One inbound and one outbound but adding an extra one inbound is a good idea should bags go astray. 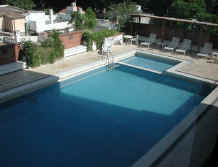 We include one (1) night at the Aylen Hotel in Penitentes, a 3***, Double or triple, half board, beverages not included. For the past years, this ski center, Penitentes, has been the starting point for most expeditions to the Aconcagua. Some expeditions go through Puente del Inca, but we prefer Penitentes because the lodging is better. In Penitentes, you can find from hostels to 3*** hotels. 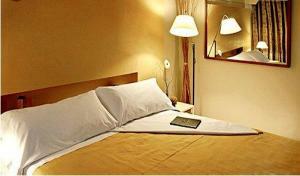 Peak Freaks works with the Aylen Hotel *** Star, which offers single, double and triple rooms with private bathrooms. The welcome dinner, breakfast and taxes are included. We include (2) nights at a basic lodge at the Vallecitos Ski Resort. All meals are included during the approach tot Base Camp and high altitude camps. Complete and balanced diet. Meals are prepared daily by the cooks at the camps. And then expedition simplified meals are organized for the higher camps. There is permanent communication, 24 hours a day, through VHF, HF radios, Satellite Telephones, between Base Camps, mountain expeditions, Penitentes and Mendoza. This is for safety and organization that will lead your expedition to be a successful one. Mules for equipment transportation (30 kg/person) up the Valle de Vacas (Vacas Valley) is included. "Responsibility and Confidence service" means taking your equipment on time and in perfect conditions to and from Base Camp and back to Penitentes. Each person has the right to transport up to 30 kg. We recommend you take a resistant bag, even though the gear is protected for transportation. We now employ two porters to 7 clients to help with loads on Aconcagua. The kitchen and food tents are completely equipped with tables, chairs, dishes. Our base camp tents is an exclusively designed dome, made to provide the highest comfort and quality services. Our Base Camps have hyperbaric chambers, oxygen equipment, oximeters and first aid kits for an immediate response under any situation. You will be seen by a medical examiner at base camp to determine your state of health for the climb. Peak Freak provides our own sleeping tents and we contribute financially to the use of the latrines established at the camps. We provide our clients with the best mountain tents available. Our Aconcagua base camp has a hyperbaric chamber, oxygen equipment, oximeters and first aid kits for an immediate response under any situation. You will be seen by a medical examiner at base camp to determine your state of health for the climb. __ 1 pair plastic expedition boots Make sure that the boot is expedition quality and has a new or in excellent condition stock liner or alveolite liner. Scarpa Inferno or similar are recommended. __ 1 pair insulated super-gaiters Super-gaiters will provide more warmth and are required. If the toe section of the rubber rand of the gaiter fits loosely you may want to consider gluing the toe section to the boot. __ 2 long sleeve polypropylene shirt Lightweight, light coloured for sunny days. __ 2 women sports bras Synthetic, no cotton! __ 2 soft shells Marmot Dri-Clime Wind Shirt, Patagonia Stretch Zephur or Krushell Jacket (R2 pullover acceptable). __ Down/synthetic sweater or vest Patagonia Puffball Jacket or Sweater preferred, R4/ 300 weight fleece jacket acceptable. __ Hard shell jacket with hood Waterproof and breathable. Gore-Tex or equivalent is best, roomy enough to fit over multiple layers. __ 1 expedition down parka with hood. This is probably your most important piece of clothing! It is important that your jacket is 700+ fill down, baffle construction (not sewn through seams) and has a thick insulated hood. We require two systems; one glove system for lower on the mountain and a mitten over-mitt system for the cold temperatures encountered on summit day. __ 1 pair modular expedition shell mitts. OR Pro Mitts If they do not have wrist straps consider sewing one on so that you can either attach it to your jacket or cinch the strap to your wrist so that you do not loose your mittens in high winds. __ Warm hat Wool or synthetic that cover your ears. __ 1 pair of hard shell pants. Waterproof/ breathable with full side zips, Gore-Tex or equivalent is best. __ 1 pair trail shoes for the hike to base camp and use at camp. __ 1 pair sandals or tennis shoes for river crossings and in camp. __ 1 daypack for the approach hike, possible use on summit day and carry-on pack. If you plan to use it for your summit pack it must be large enough for your down jacket, misc. clothes, food and water. The Lowe Alpine Neutrino or Black Diamond Speed 28 are excellent, lightweight (16 oz.) choices. __ 1 first-aid kit With ibuprofen and any other doctor recommended medications including a full dose of Ciproflaxin and some Diamox. __ 3 Water bottles 1 liter wide-mouth Nalgene (1 is a pee bottle). __ Hydration bladder With drinking tube for lower mountain-(optional). __ Plastic mug With snap-on lid, 16 oz. or larger. __ Bowl and spoon Plastic, small Tupperware works well. Lexan spoons are best. __ Pocket knife Small Swiss-Army type. __ Water purification Iodine tablets or Polar-pure crystals. __ Toiletry kit Be sure to include toilet paper stored in a plastic bag. Women: Tampons and storage bag for disposal. Midol and other cramp meds. Iron supplementing pre-expedition is also a very good idea for our female climbers to help with acclimatization. __ Favorite snack foods No more than 2 pounds! __ Paperback books, cards, iPod etc. __ Passport and passport photos- passport valid for not less than 6 months from your arrival date. $1000 US deposit is due at time of booking. Final amount is due: 90 days prior to departure.